BCCC members participate in nationally organised marathon racing competitions such as the Hasler Trophy series and other nationally recognised marathon events as well as BCCC-organised events such as the monthly Hare and Hounds time trial and the annual Charles Hick Canal Challenge (see below). Details of all the rules and regulations for all sprint and marathon races can be found in the annual Racing Handbook. The main championship that our flat water racing members enter is the Hasler Trophy. This is the National Team League Championships and all canoe clubs with a racing section in England take part. Qualification for the Hasler Trophy Final in September annually is done on a regional basis. BCCC is in the Southern region. Points are awarded for race positions and the top four clubs in each region go forward to compete in the annual Hasler Final. To take part in the final you have to have completed at least three qualifying races during the season (1st September – 31st August). BCCC paddlers compete at Clubs such as Pangbourne, Reading, Wokingham (Reading), Longridge (Marlow), Henley, Windsor, Southampton, Oxford and Banbury. The next Southern Region Hasler event can be found on the racing calendar which can be found here. 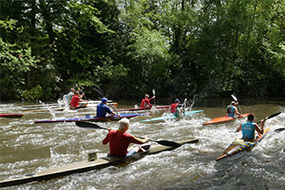 Each year B3C hosts one of the Hasler series of races at its home on the Basingstoke Canal in Mytchett, Surrey. The race generally takes place in May each year and is traditionally the first race of the Hasler year in our region. The exact details of this year’s B3C Hasler race is available on our Calendar page. Simply click on the race event and you will be able to download the Race Notice and Entry Form. The Hare and Hounds time trial takes place on the 3rd Saturday of each month at the Canal Centre, Mytchett. The Charles Hicks Canal Challenge on the Basingstoke Canal takes place each year towards the end of the year, usually in November. It is in memory of Charles Hicks, one of our founder members, who was a founder member of the club and had a long and enthusiastic career as a B3c paddler. The challenge includes a Schools Trophy which can be competed for by School teams.